The original skin-saving, five-in-one face formula, eb5 Intense Moisture Anti-Aging Cream hides, heals, protects, and perfects! Slather on this intensely rich, deeply-hydrating moisturizer and anti-aging cream loaded with powerhouse antioxidants, like vitamins E, A, and Pro-Vitamin B5 to help boost molecular regeneration, fight free-radical aggressors, reverse, repair, and restore skin from existing damage, tone and tighten texture, and boost lipid barrier function for plump and pretty skin. For over 60 skin-loving years, this skin-solving, anti-aging dream cream has proven effective, safe, pure, and gentle to impart radiant luminosity, health, glow, and dewiness to the skin. Complexion-perfecting formula contains oat kernel extract to condition, nourish, and hydrate the skin, while anti-inflammatory comfrey root soothes and supports the susceptible lipid barrier. Reduces the appearance of wrinkles and fine lines, restores skin resilience, repairs and reverses signs of inflammation, and renews skin’s strength, tone, and texture for a brilliant, beautifully-balanced complexion. Preps, primes, perfects, and “plumps” skin as a pre-makeup complexion cream to help even skin tone, while providing a clean, hydrated canvas for cosmetics. Before bedtime, this plant-based formula helps skin to heal and combat stress during the restorative and rejuvenating sleep cycles. This clean, clinical, and un-complicated anti-aging cream is the multi-tasking must-have for any anti-aging arsenal or beauty regimen. 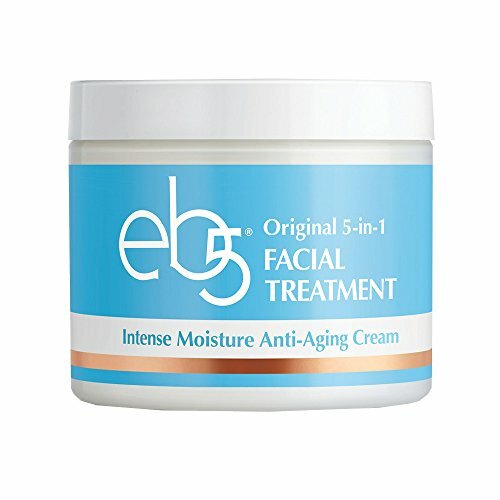 Created by renowned pharmacist Robert Heldfond Sr. in the 1950s as an odorless, grease-free answer to safely and efficiently allow the deep penetration of topical medications into the skin of badly-burned patients, eb5 Skincare was born. It was the nurses who were administering the astounding medicinal cream to their patients daily who were most taken by the transformation of their own skin, and asked Heldfond to concoct a non-medicinal version that can be used every day. COMPLETE PACKAGE SKINCARE: This luxurious, whipped wrinkle cream is like a “face lift in a jar,” as it helps reduce wrinkle depth, restore skin’s elasticity, repair inflammation, and renew skin strength, tone, and radiance. Packed to the brim with beautifying botanicals, vitamins, and free-radical-fighting antioxidants, this rich, anti-aging cream delivers long-lasting hydration for a more youthful-looking appearance. MOST EFFECTIVE ANTI-AGING INGREDIENTS: Unique, proprietary formulation contains skin-saving, powerhouse antioxidant vitamin E to help boost healing and build cellular regeneration, while neutralizing free-radical damage. Pro-Vitamin B5 prettifies, preserves, perfects, and protects as it fights free-radical oxidation to skin cells, while helping to repair and reverse existing signs of aging and protect against future damage. REPAIRS, RESTORES, AND REPLENISHES: This rich, intense anti-aging cream is loaded with the gentlest form of Vitamin A to help firm and tone laxity, as well as increase much-needed moisture levels. Anti-inflammatory oat kernel reduces redness and adverse irritation, while soothing and smoothing skin’s surface. Beautifully balances pH levels to prevent blemishes and flare-ups, while boosting hydration. Comfrey root soothes and support’s water content and retention capabilities. DAYS TO VISIBLY YOUNGER-LOOKING SKIN: This amazing face-firming, moisturizing cream delivers real, remarkable results – real fast! Enjoy a more improved texture, tone, and tightening around face and neck. See smoother, softer, more supple skin and a firmer feel to the face and neck in just seven short days! ALL NATURAL, NO “NASTIES”: This intense anti-aging moisturizer is specifically formulated for sensitive skin types as it soothes, smoothes, and softens without parabens, gluten, fragrance, irritants, or other potentially harsh and harmful chemicals. This made-in-the-USA, pharmaceutical-grade anti-aging cream is also cruelty-free, non-GMO, dermatologist tested, and hypoallergenic. If you have any questions about this product by eb5, contact us by completing and submitting the form below. If you are looking for a specif part number, please include it with your message.